So the pastor is preaching on the Good Samaritan at the upcoming lecture series. You know the story; it is one of the top ten most famous stories in the Bible – even gets hospitals named after it. And the congregation is full of anticipation for this really good sermon about “Who is my neighbor?” that Jesus first preached to a lawyer seeking to test Jesus. All the elements are there for the drama: The injured man left for dead on the side of the road, the Priest passing by on the other side, the Levite passing by on the other side, and the Samaritan, of all people, who stops to help! Oh, yeah, and at great personal expense of time, energy, and money. Not expecting anything in return for his trouble, but simply doing what is right for a fellow man – A NEIGHBOR. Yeah. It should be a good lecture series coming up. But there is a scheduling conflict for some of the parishioners. So they carpool together in hopes of cutting out of the When-Helping-Hurts class a few minutes early so they can arrive at the pastor’s lecture on the Good Samaritan only a few minutes late. If they coordinate and rush, they can just make it. They think. But of course the short cut they take leads them through the poor area of town on the other side of the tracks and up to an intersection known for panhandling. There is a pregnant pause as they wait for the light to change. 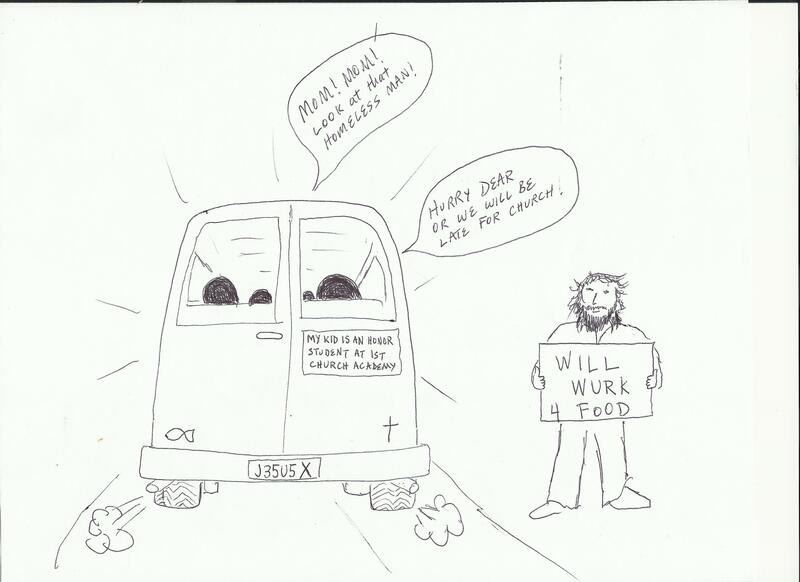 No one in the church van dares to utter a word. Everyone averts their eyes away from the beggar on the corner, and the driver stares nervously at the red light hoping it changes to green fast. This is the state of Christian faith in America today. Little crisis after little crisis going ignored to the best of our ability. How do you vote conservative and love your neighbor? How do you vote liberal and love God? And yet the “Christians” find themselves empowered by a voting spirit rather than a Holy Spirit at every red light. And they are not so sure they really want to hear a story about the enemy who, it turns out, is capable of loving THEM…we want to know who is my neighbor. But what happens when your enemy, whom you hate, turns out to be your neighbor who loves you!!! !